Using an X-Acto knife, ruler and cutting board, cut out a triangle. Use the triangle you cut as a pattern to cut out a second shape. Then cut the second triangle in half. Hot glue the two halves to either side of the whole triangle and you’ve got a tree. 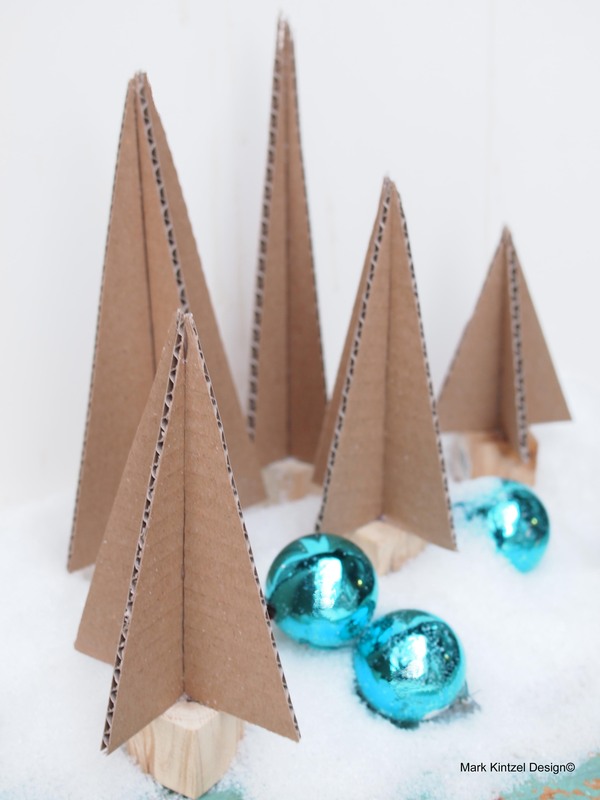 This step is optional but you can hot glue your trees onto tiny wooden blocks. I found these at AC Moore arts and crafts store. 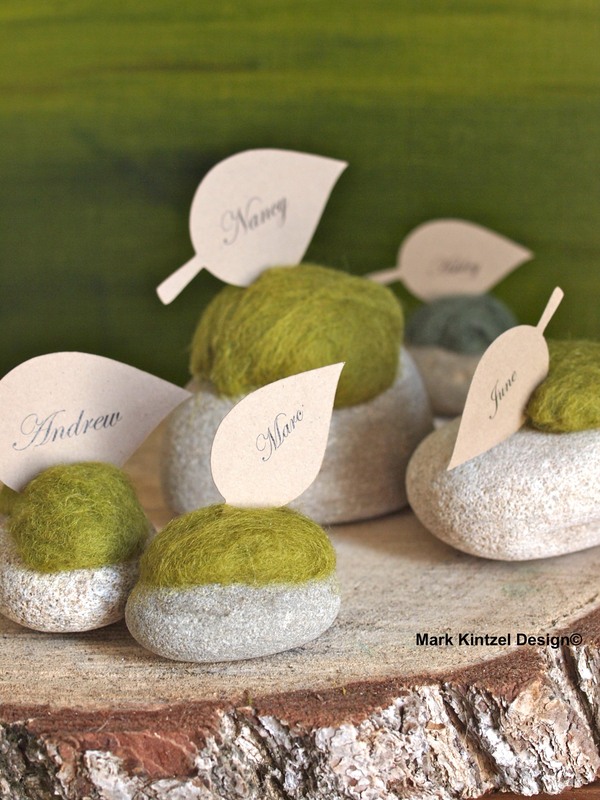 These recycled beauties look even better painted or use them as gift tags! Write a name on the cardboard and tie it to a package. Perfect! Cut a piece of the peel-&-stick moss slightly larger than a shipping tag. 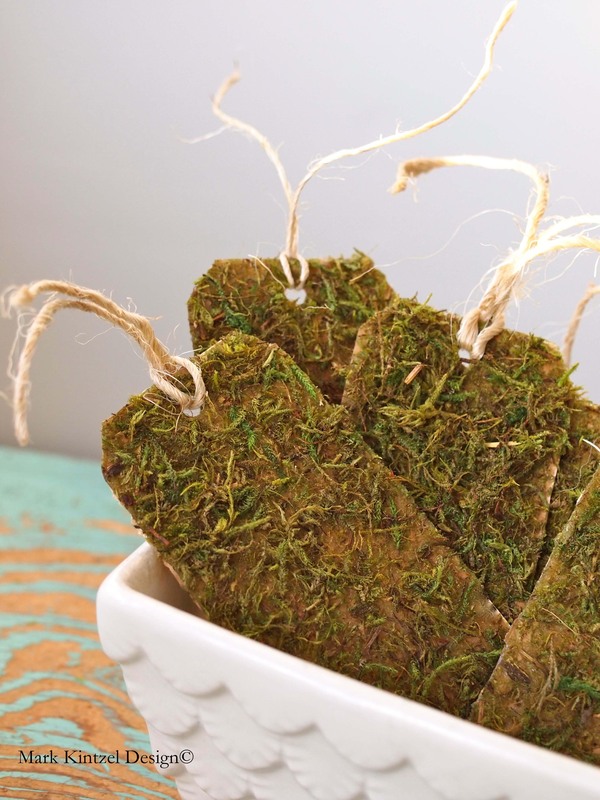 Remove the paper on the back of the moss to reveal its tacky side then place firmly on the tag. Punch a hole in the top of the tag and insert twine. 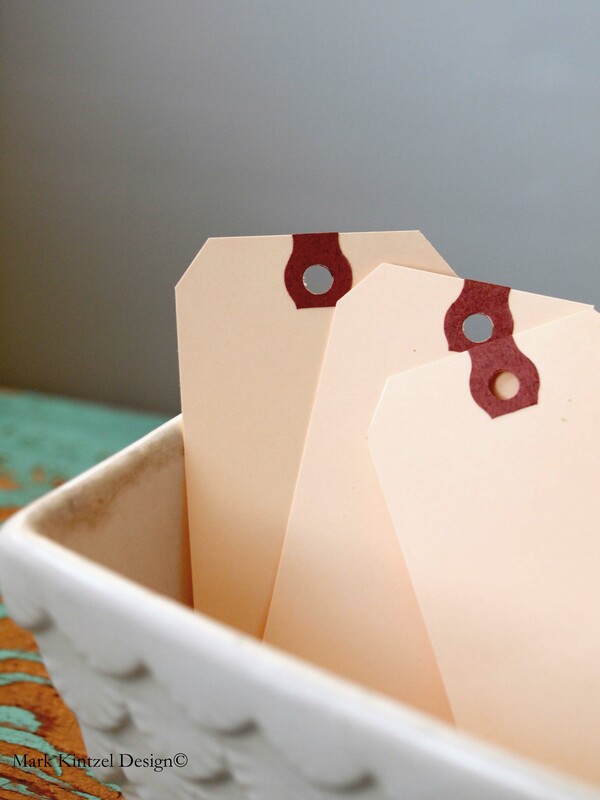 Okay, how easy is that AND you have a really cool and creative gift tag to adorn your Easter gifts! Happy crafting! My niece, Samantha, is a super artistic nine year-old. 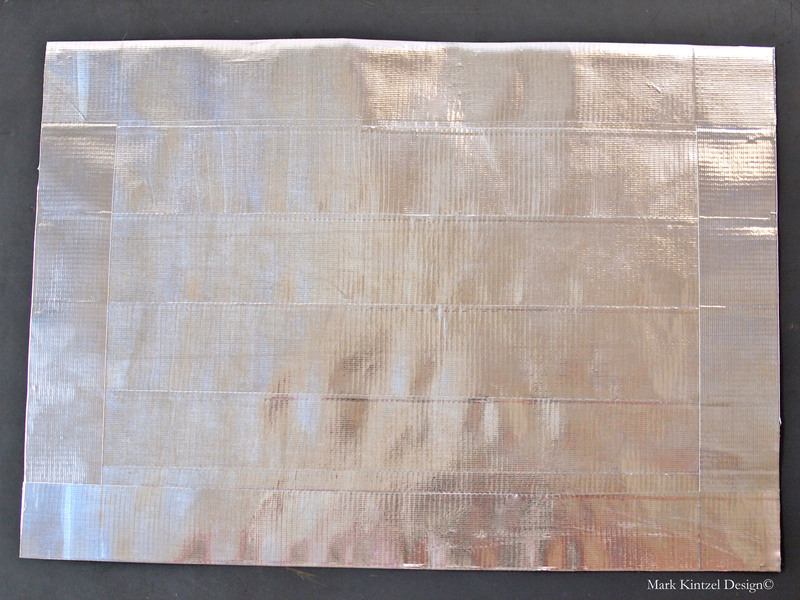 Her latest medium is duct tape and she’s cooking up all sorts of clever crafts. Inspired by Samantha I decided to give duct tape a whirl. I’m always on the lookout for unique objects at sales and flea markets and recently I found a few outdated road atlas books. The individual pages are the perfect size for placemats. Using duct tape and Mod Podge, I easily and quickly created these placemats. 1. 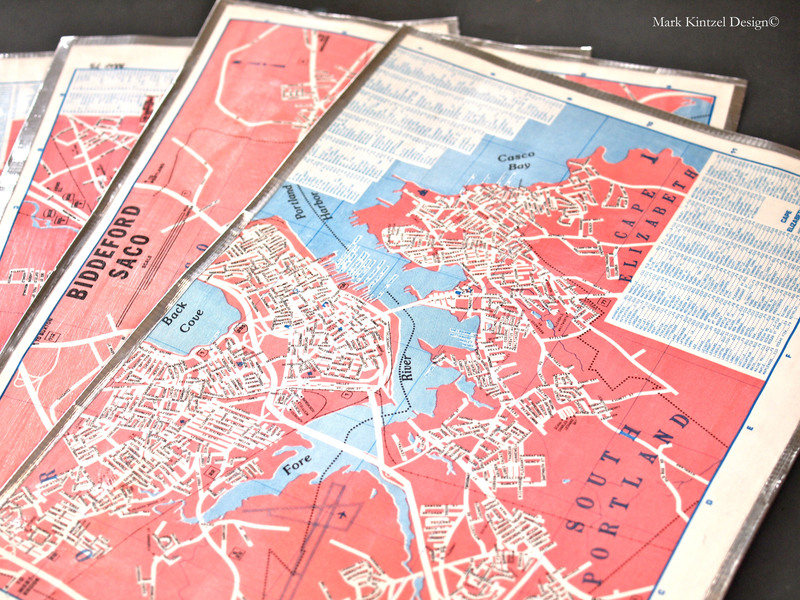 Select pages from the Road Atlas and remove them from the book using an X Acto knife. 2. Completely cover the back of map with duct tape, place the map on a cutting mat then cut any excess tape using a ruler and X Acto knife. 3. Flip the map over and brush a coat of Mod Podge (Outdoor) on the top of the placemat. This will seal and protect the placemat. 4. This next step is optional — after the Mod Podge glue is dry, place a border of tape around the map (see photo of placemat grouping above). This simply gives it a more framed and finished look but it’s not necessary. Oh, we’re not done yet….sorry. 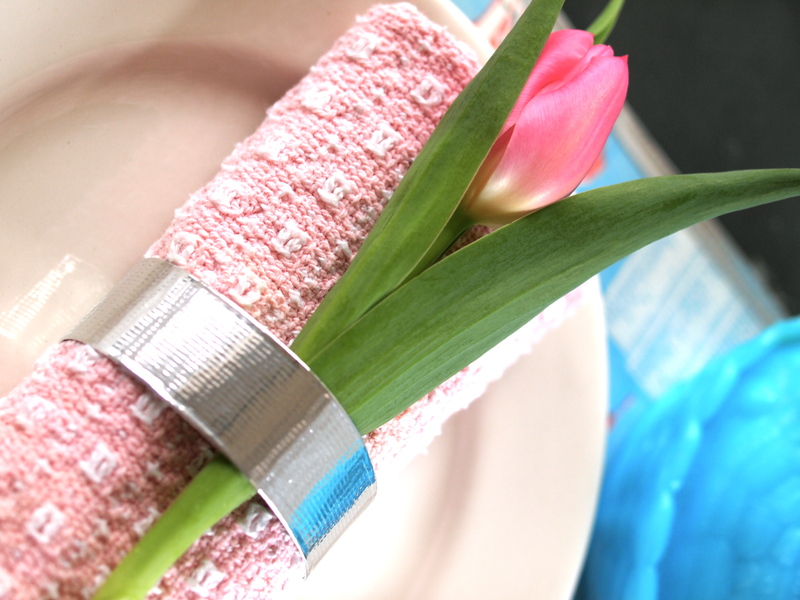 If you’re feeling super crafty, you can make a Duct Tape napkin ring too! Simply roll out a piece of tape about 10 inches, fold the tape in half (sticky side to sticky side). Form a loop by curling one end over and stapling it to the other end. Cut the excess and you’ve got yourself a pretty cool napkin ring. There was a fantastic department store based in Allentown, Pennsylvania called Hess’s. 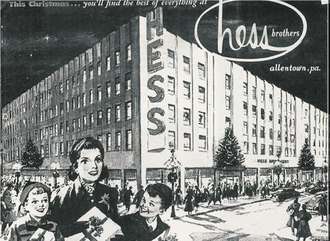 Founded in 1897, Hess’s was a shopping destination. Flamboyance and excitement were the norm for this store. It was well-known for its fashion apparel as a result of introducing the latest trends from Europe. It was also well-known for its world-famous Patio Restaurant and their scrumptious strawberry pie. Simply put…the pie was heaven. Sadly, however, the flagship store was demolished in 1996 but the memories and the pie recipe live on! A few years ago I stumbled upon a couple of recipes for the pie and with some experimenting, came up with my own version which tastes exactly like the original albeit a bit smaller. You see, Hess’s strawberry pie was ginormous! Here’s my version of this delectable dessert. PS: Whenever possible, I always use organic ingredients. Pre-made, non-bake, 9-inch pie crust. Of course you can make your own but in a pinch, I buy pre-made. 4 lbs. of strawberries, rinsed and hulled. 2 packets of clear glaze powder. This will make 2 cups of glaze. 2, 16 oz. containers of heaving whipping cream. Sugar (for the glaze mixture). Powdered sugar to taste (for the whipped cream topping). 1 packet of cream stabilizer (for the whipped cream topping). Prepare pie crust if needed. I use a shortbread pre-made pie crust….yummy! Prepare your strawberries by cutting out the stems and then cut the berries in halves. Prepare the glaze by following the instructions on the glaze packet. The directions instruct to add water but I use organic cranberry juice instead. Spoon a 1/2 inch layer of glaze in the bottom of the pie crust. Then add in the first layer of berries. Spoon another layer of glaze and then another layer of berries. Repeat until all of the berries are jam-packed into the crust. Refrigerate while you make the whipped cream. Pour 2 containers of heavy whipping cream into a chilled mixing bowl. Start whipping! As the cream starts forming peaks, add a packet of cream stabilizer and then add powdered sugar to taste. I added about 1/2 cup. 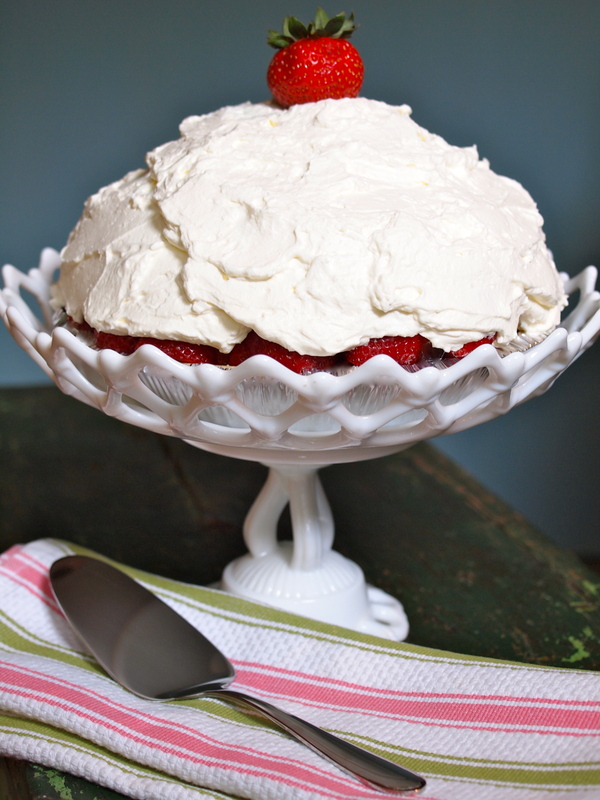 Finally, spread ALL of the whipped cream over the berries. Refrigerate for about an hour then serve. Happy baking and happy crafting!